In December 2006, the Municipal Corporation of Kochi came up with a rather ingenious way of disposing its garbage loading it on to trucks and sending it to remote villages in neighbouring districts; even neighbouring states. A contractor was granted permission to transport the waste at the rate of Rs 1,365 a tonne. The municipal corporation didn't bother to ask the contractor about the dumping site, or whether he had obtained no-objection certificates from villages where the dumping was to happen. A convoy of garbage trucks rolled out. On December 6, 19 garbage trucks from Kochi reached the Moolahalla forest checkpost near Bandipur National Park in the neighbouring state of Karnataka. Having traversed five districts of Kerala, they were headed to Gundulpett, a small village 20 km from the checkpost. The forest guards asked for the papers required for such a transfer. All that the truck drivers had was a copy of the agreement between the contractor and the Municipal Corporation of Kochi. The drivers were held at the checkpost that day. The next day, the matter was resolved. The garbage was dumped on some private land. To the corporation's great embarrassment, police and local residents in some parts of Tamil Nadu put up a spirited resistance. At some places, like Kambamettu on the Kerala-Tamil Nadu border, the truck drivers were manhandled. The garbage convoy roamed all over, searching for a safe place to dump. On January 4, when eight loads of garbage were dumped at Veeranpotta near Nalleppilly in Palakkad district, irate residents protested and marched to the police station, which ended up in a lathicharge. All this notwithstanding, the municipal corporation granted a licence to another contractor who reportedly had "acres of fallow land in Guddalore and waste treatment facilities". The rate offered this time was Rs 1,600 per tonne. A quick recap is essential to understand Kochi's desperation. The fast-growing city, with 700,000 people plus a floating population of 100,000, generates around 380 tonnes of municipal solid waste each day; 150 tonnes is biodegradable and 100 tonnes is plastic. But the city had never had effective garbage treatment facilities. A landfill at Cheranellore village had to be abandoned in 1998 after public agitation led to the village council passing a resolution against dumping. The municipal corporation acquired 15 hectares the same year in Brahmapuram in Vadavukod-Puthancruz, a suburban village, for a solid waste treatment plant. But this land is marshy; it is close to the Kadambrayar, a major waterbody that connects with the rivers Chitrappuzha and Manaykkathodu. Four village councils depend on the Kadambrayar for drinking water, and about 300 families of fish workers also depend on it. The villagers were up in arms against the dumping site coming up in their neighbourhood. As is typical of Kerala, the matter soon became highly political, and the dumping site had to be shelved. After exhausting all other options, in 2002 the corporation started dumping at a site owned by the Cochin Port Trust, close to the headquarters of the Southern Naval Command on Wellington Island. The navy allowed a stopgap sanitary landfill to give time for the construction of a proposed solid waste treatment plant. But this created a problem birds congregated at the garbage dump, and bird hits became more likely for aircraft at ins Garuda, the navy's aviation establishment. The navy repeatedly took up this issue with the corporation. Repeatedly, the municipal corporation sought extensions for the use of the landfill due to delays in setting up the treatment plant. Matters came to a head on September 30, 2006, when the navy asked the municipal corporation to stop dumping garbage in the vicinity of the airfield. The main runway needed repairs, and the one near the dump was required. Mercy Williams, mayor of Kochi, led a delegation to chief minister V S Achuthanandan, asking him to intervene. On October 4, 2006, the chief secretary of Kerala requested the navy to permit dumping at the site for 20 more days. The chief minister spoke to the flag officer commanding-in-chief of the Southern Naval Command. But the navy's concerns were thrown into high relief the very next day. A disaster was averted when a bird hit a Dornier aircraft of the Coast Guard near ins Garuda, dangerously close to large oil tanks close to the runway, and in the vicinity of a thickly populated area. The navy allowed dumping till October-end to help clear heaps of garbage in the city. In November, a delegation of the municipal corporation flew to New Delhi and appealed to A K Antony, Union minister of defence and a former chief minister of Kerala. This secured Kochi another month of dumping at the location. But by January, the navy had put its foot down. That's when the garbage trucks started rolling out. On January 5, 2007, a division bench of the Kerala High Court directed the municipal corporation to dump waste at Brahmapuram. The court ordered it to seek police protection if faced with villagers' protests. The court was examining whether the corporation could be held under contempt of court for not submitting a detailed plan for solid waste disposal in accordance with previous orders. This was expected. The ombudsman for the local government, justice C K Chandrasekhara Das, had warned the corporation in 2005 of an "explosive situation" once the navy disallowed dumping. But the corporation ignored the warning. "None of the five city corporations and 53 municipalities in the state follow the rules," says M M Abbaz, president of Trikkakara Waste Management Society, an ngo. The corporation has now decided not to dump waste at Brahmapuram. Land owned by the Greater Cochin Development Authority at Mundamveli will be used for dumping. The corporation says it will set up a solid waste treatment plant in a time-bound manner. Estimates show Kerala generates 3,000 tonnes of garbage everyday. Less than a half of this is collected, and a tiny amount is processed or recycled. The rest is simply dumped in waterbodies or badly planned landfills, endangering public health and contaminating soil and water. Urban India's tryst with garbage is played out in many theatres. Surat Municipal Corporation in Gujarat has developed a sanitary landfill of 3.6 hectares on a tract of saline land near Khajod village, about 15 km west of the city. The landfill was ready three years ago but it has not been used. The Gujarat State Pollution Control Board (gspcb) has not permitted disposal of mixed municipal solid waste in the landfill, says Asit Nema of the Foundation for Greentech Environmental Systems, an ngo in Delhi that researches water and sanitation. Nema prepared a case study of solid waste treatment and disposal technology options in January 2007.
gspcb has rigidly interpreted the Municipal Solid Waste Rules 2000, under which only non-biodegradable waste--that which can't be recycled or processed biologically--should be consigned to a landfill (see box Have rules, will violate). 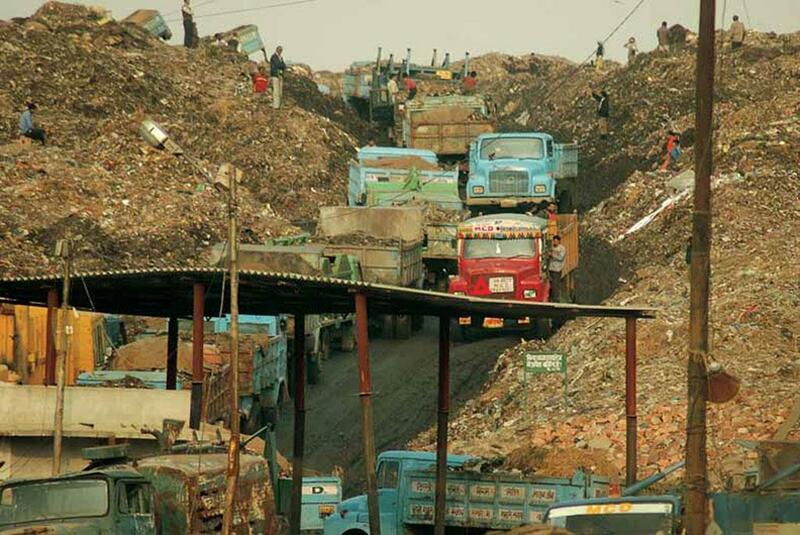 The Municipal Solid Waste Rules were notified in 2000 under the Environment (Protection) Act. These put the responsibility of garbage management—collection, storage, segregation, transportation, processing and disposal—on municipal authorities. The Central Pollution Control Board (CPCB) and state pollution control boards are supposed to monitor and ensure compliance of standards. The deadline for all civic bodies to comply with the rules was December 31, 2003. “Not a single municipality is in full compliance,” says a CPCB official. How? For example, the rules mandate garbage disposal only after biological stabilisation, which is hardly practised anywhere in the country. "Since the corporation does not have facilities for biological treatment of garbage, it is not in a position to separate either the rejects or inerts," says Nema. This has created an impasse the board has said the sanitary landfill can be used only after the treatment facilities have been set up, regardless of the negative impacts of current inefficient practices. "As a result, the Surat Municipal Corporation is forced to dispose the unsegregated garbage outside the sanitary landfill, which tantamounts to open dumping," says Nema. This means both the corporation and gspcb have held sensible garbage disposal to ransom. After each monsoon, the corporation is required to dewater the landfill. It specially installed dewatering pumps two years ago, and that investment is wasting away. 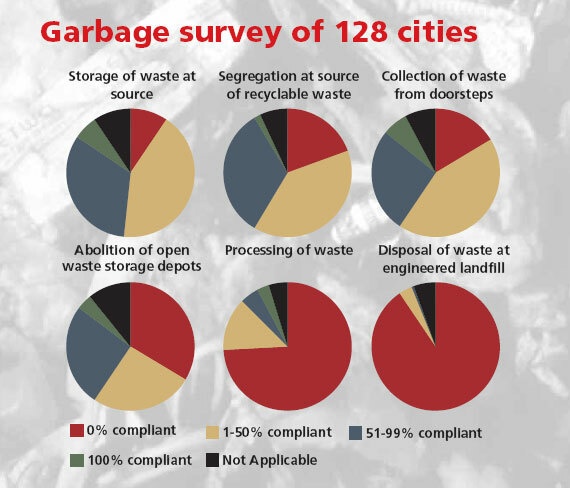 Surat and Kochi highlight the difficulties of sanitary landfills. An alternative is converting waste to energy--burning garbage to produce electricity. There has been considerable excitement about waste-to-energy (wte) plants, especially from businesses that want to avail government subsidies. The Union ministry of new and renewable energy (mnre) offers interest subsidies of up to Rs 2 crore per megawatt for commercial wte projects. For demonstration projects, direct subsidies up to 50 per cent of the capital cost of the plant (up to Rs 3 crore per megawatt) is offered. Municipalities can get incentives of Rs 15 lakh per megawatt for providing garbage free of cost to wte plants for up to 30 years. State nodal agencies get incentives of Rs 5 lakh per megawatt for promoting and monitoring wte projects. There is ample incentive for businesses and government bodies to scratch each other's back. But how does this partnership work? Only four wte plants have come up in India. One each in Hyderabad, Vijaywada, Lucknow and Delhi. The Delhi plant shut down within 21 days of its commissioning in 1990, and hasn't operated since. The Lucknow plant, the foundation stone of which was laid in 1998 by the then prime minister and Lucknow Lok Sabha member Atal Behari Vajpayee, was commissioned in 2003. It never operated on full capacity, and closed down in 2004. It remains shut. Down To Earth visited the Hyderabad wte facility to assess its performance. In 1996, Jyothsana G wanted to move out of Andhra Pradesh's capital Hyderabad and into quieter rural surroundings. She had spent more than a year looking for a place to build the house of her dreams. She found it in Gandhamguda village of Rangareddy district's Peeramchervu panchayat, a few kilometres from the municipal limits of Hyderabad. "It was sylvan," she says.In 1999, selco Industries Ltd set up a municipal solid waste processing unit in the vicinity. Now the area has become a dump for hundreds of tonnes of garbage from Hyderabad. Earlier, people depended on groundwater for all needs. Today, Jyothsana buys jars of packaged water at Rs 65 for every 20 litres one jar every second day. But packaged water can't irrigate fields. "Farming has stopped completely in all the three hamlets in the area," says T Sanjeeva Reddy, a resident and head of the citizens' Joint Action Committee, which leads the protest against the plant. Gandhamguda, which means a 'nice fragrance' in Telugu, derived its name from the sandalwood trees for which it was known. Today, it's only durgandham (bad smell in Telugu), say residents. The selco plant is spread over two locations the plant at Gandhamguda can process garbage into burnable pellets (or refuse-derived fuel, or rdf), while the power plant of 6.6 mw capacity is about 40 km away in Shadnagar district. Residents of the area, who watch garbage trucks coming to the plant daily, say that the plant processes no more than 150-200 tonnes per day--much below the proposed capacity of the plant--while the rest of it is dumped outside. Anybody can see that the area surrounding the plant is now an open dumpyard for unprocessed garbage and processing refuse. selco got the land almost free of cost and the garbage, too, came free of cost from Hyderabad. It got a subsidy of Rs 28 lakh from mnre. Besides, a soft loan of Rs 4.55 crore was taken from the centre's Technology Development Board, and another Rs 2 crore loan from the Indian Renewable Energy Development Agency. The promoters' equity was Rs 3.51 crore, putting the plant's total cost at Rs 10.34 core. There are several other subsidies that the plant might have availed of. "They openly burned waste, including plastics, and toxic fumes engulfed the entire area. They would get all kinds of garbage, including broken thermometers, used batteries, sanitary chemical containers. Mounds of decaying organic matter and flesh attracted birds of prey, pigs and dogs," says Reddy. "Smoke from this hillock of unmanaged waste, around 8 hectares and at least 30-feet high in just four years, has led to a plethora of health problems among the 100,000 plus residents living nearby," says Almitra Patel, environmentalist from Bangalore who in 1996 petitioned the Supreme Court against open dumping of garbage by Class I cities (> 1 million people). "The selco plant is highly polluting, too, as it burns dried waste of all types in order to dry fresh garbage. Their actual recovery of pelletisable fuel-waste was said to be below 20 per cent. Certainly, the quantity of rejects (again dumped outside) looked almost the same as what went into the selco system." In 2001, residents of the three hamlets held a 15-day sit-in at the plant gate. The Andhra Pradesh Pollution Control board tested the groundwater. The tests showed "absolute bacteriological and organic contamination of groundwater". It was very acidic, with very high levels of chlorides, sulphates and nitrates, which causes diseases like cancer. 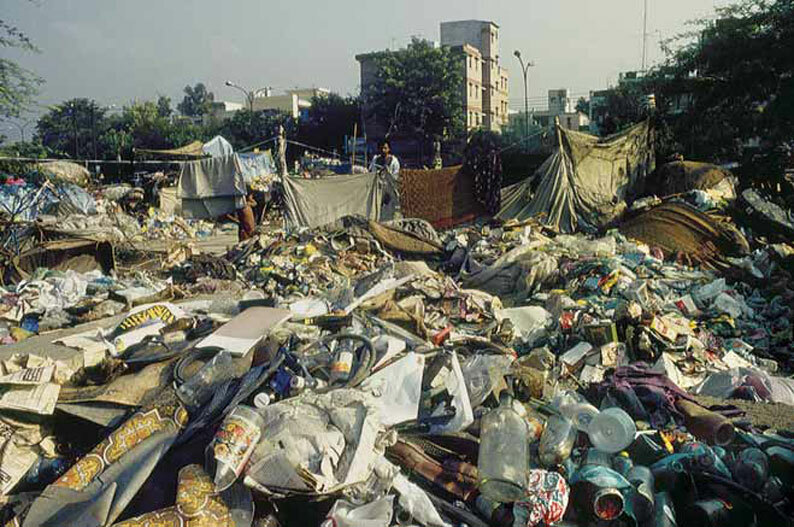 As the Municipal Corporation of Hyderabad had not got authorisation from the board, it stopped the corporation from dumping garbage at Gandhamguda, December 1, 2001 onwards. But the order was rolled back within a month. "The plant owner is very powerful," says a villager. On December 18, 2001, the board allowed the corporation to supply 150 tonnes per day of organic rich garbage to the selco plant. However, there was a rider the supply had to be on the premises of the plant.But one visit to the area shows this condition is not met. The board also asked the corporation to "immediately supply drinking water to the affected villages". R Prakash, sarpanch of Peeramchervu panchayat, says, "They were to supply one tanker a day. Today, we get one in three-four days." "They continue to burn waste outside the plant, though not as frequently," says Reddy. "The groundwater is unfit for even irrigation. There is high incidence of health complaints like jaundice, nausea, asthma, miscarriages and infertilty," complains Prakash. Jyothsana says villagers have started selling land and moving out as they can't grow anything "Had the plant been successful at waste management, we would have gained something. But it is an all-round failure," she says. The plant is shut 10 days out of 12, and most waste is dumped in the open. Says Reddy "They burn rice husk to make energy." Patel's submission to the court confirms this "The selco plant is virtually defunct. During two visits in 2002 and 2003, [I] observed an empty drying yard, non-functional equipment, and cobweb-covered conveyors, with the plant compound surrounded by huge piles of burning waste, a large amount of leachate at the foot of the hillock, and fresh waste being fed on by pigs and cows, just outside the premises." The ash from burning garbage is sent to brick manufacturers. "This is toxic ash and must be sent to a secure hazardous waste landfill," says an official of the Central Pollution Control Board, Delhi. Villages surrounding the plant have petitioned the high court against the plant, and the matter is pending. When Down To Earth visited the plant it was not operating. The guard said it had been shut down temporarily. selco officials refused to comment, resorting to abusive language. In her petition to the Supreme Court, Patel demanded a stay on the subsidy to wte plants and an independent review of such plants based on the experience in the Lucknow and Hyderabad plants. 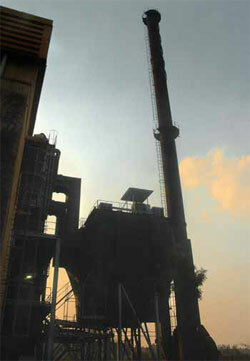 In 2005, the Supreme Court ordered the creation of a committee to study the performance of wte plants. This 14-member committee was chaired by Dilip K Biswas, former chairperson of the Central Pollution Control Board. "Most of the members have a direct or indirect interest in the promotion of wte," says Patel. "It is a case where the subject of investigation itself (mnre) has taken up the responsibility of review and assessment," says Gopal Krishna of the Centre for Social Medicine and Community Health, Jawaharlal Nehru University, Delhi. The committee's report came out in December 2005.Two of its members--Shyam Asolkar, professor at the Indian Institute of Technology, Mumbai's Centre for Environmental Science and Engineering, and Girish Sant of the Pune-based Prayas Energy group--submitted a "differing report". Both the reports raised apprehensions about the wte plants at Hyderabad and Vijaywada. "Some discrepancy about use of biomass and plant load factor... was noticed... these project could be better engineered," says the majority report. The differing report is more direct "It should be recognised that a sizable fraction of the power generation from both plants is coming from combustion of supplementary fuel, that is, biomass (rice husk, in the case of selco)." It stressed that biomass was contributing 31 per cent and 52 per cent of the total energy in case of the selco and Vijaywada plants, respectively. mnre allows only up to 30 per cent supplementary fuel in wte power plants. Clearly, both plants are violating norms. And this is based on data provided by the project promoters. The differing report questions the quality of their data "The variation in the heat content of [waste pellets] over months is large--from below 1,000 kCal (kilo calories) to over 4,000 kCal/kg. Such a large variation is difficult to understand. Low heat content in some non-monsoon months (such as October-December) and high heat content in some monsoon months (June and July) are also unexpected..."
The majority report justified the subsidy on wte projects because "the operational problems of one plant should not form the basis to judge the efficacy of a particular technology option or for rejecting the technology as a whole". It attributed the closure of the Lucknow plant to its operation at low capacities for one year due to an ineffective garbage segregation system. The differing report says the reason can't be established, because the plant shut down before monitoring started. Based on bio-methanation, the Lucknow plant was set up by Enkem Engineers of Chennai at a cost of Rs 76 crore. mnre gave it subsidies of Rs 15 crore. It was planned that 300 tonnes of garbage from Lucknow would be processed into 115 tonnes of volatile solids for incineration to generate 5 mw of electricity. For most of its operational days, the power output was between 0.2 mw to 0.6 mw. The matter to note is that the plant can use only 115 tonnes of 300 tonnes of garbage supplied--the remaining has to be dumped. Moreover, out of the 115 tonnes used, significant amounts are rejected. "How can you call them wte plants when they use other feedstock? They should not be entitled to the wte subsidies," says S S Khanna, former adviser to the Planning Commission, describing the selco plant. "Promoters jump to get the subsidy and set up the plant without ascertaining the physical and chemical characteristics of municipal solid waste, and when it does not work, they burn material which can be used in better ways. It is these failed projects the mnre is trying to showcase to sell more such projects all over the country," he says. "Increasingly, cities are abandoning composting and waste stabilisation (as required by the rules) for wte. It promotes waste generation because garbage is profit, undermining the 'reduce, reuse, recycle' credo of sustainable waste management," says Patel. wte promoters say such projects are successful in industrialised countries. "What is good enough for them is good enough for us," says an mnre official. The Supreme Court doesn't buy mnre's argument. On January 4, 2007, it refused to lift the stay on subsidy for wte projects that was imposed in May 2005 in the case filed by Patel. Should public health be sacrificed to waste? Garbage incineration is a trench war with clearly drawn battle lines. The Union ministry of urban development (moud) has been sceptical of wte. Social and environmental groups are dead against it. ap Transco, power supplier in Andhra Pradesh, has petitioned the Supreme Court about the high tariffs it is forced to pay to wte plants. But mnre is pushing for it, citing examples of such plants operating in Europe. But the ministry is giving only half the picture. On February 13, 2007, the European parliament refused to treat incineration at par with recycling. "Incineration is discredited in the West; the wider public considers it obsolete and polluting. There hasn't been a new incinerator proposal in a decade, until recently. Severe public pressure has made it politically impossible to build incinerators," says Annie Leonard, member of the us steering committee of the Global Anti-Incineration Alliance. "Between 1985 and 1994, at least 280 us incinerator projects were cancelled," writes Blenda Platt of the ngo Institute of Local Self Reliance in Washington dc, in her April 2004 report Resources up in flames. She says improved pollution control regulations have forced the closure of several existing incinerators. For example, eu's 1996 guidelines resulted in the closure of 23 of the 28 operating incinerators in the uk. More recently, 509 waste incinerators in Japan are slated to close because of stricter dioxin emission standards in 2002. From December 1998 to May 2002, 170 incinerators in Japan were decommissioned after failing to meet revised standards. The Philippines may be the only country with a national ban on incinerators, Platt points out. But, as the market in the West shrinks, incinerator manufacturers are eyeing developing countries. "Dozens of incinerators are currently proposed in industrialising nations," says Platt. Incinerators' emissions contain dioxins, the most toxic of all humanmade substance. These are carcinogenic, cause neurological damage, and disrupt the reproductive, thyroid and respiratory system, among other things. They are produced when chlorinated plastics (like pvc) are burnt. In February 2006, the European Commission adopted a new law setting emission levels of some dioxins and dioxin-like polychlorinated biphenyls in food and feed. According to Paul Connett, chemistry professor at St Lawrence University in Canton, New York, three French solid waste incinerators were closed in January 1998 because milk from cows on nearby dairy farms was found contaminated with excessive levels of dioxins. A study in the British Journal of Cancer says people living within a 7.5-km radius of a municipal solid waste incinerator have an increased likelihood of getting several cancers. The 1996 research studied 14 million people living near 72 incinerators in the uk. Incinerators release carcinogenic chemicals from their smoke stacks, including heavy metals (such as arsenic, lead, cadmium, mercury, chromium and beryllium); acid gases, including hydrogen fluoride; partially-burned organic material such as pvc; herbicide residues and wood preservatives; other organic chemicals, including polycyclic aromatic hydrocarbons; and dioxins and furans. One recent analysis identified 192 volatile organic compounds being emitted by a solid waste incinerator. How much do we know? The presence of pvc in Indian garbage is well known. "Analysis of garbage fed into the Lucknow and selco projects points to sizeable amounts of plastics--about 3-5 per cent by weight in the case of Lucknow. It is possible that this includes high amounts of pvc," says the differing report of the committee on wte. The committee noted the lack of monitoring of dioxins and furan, as well as standards on their emission. Both the majority and the differing reports express the need for undertaking a "detailed study on the issue of dioxins and furans and formulate standards and safeguards". The majority report says " mnremay also sponsor research and development projects to monitor the emissions from the plants in steady as well as disturbed state of operation". But the same group changes stance in its rejoinder to the differing report. "The committee feels that the strategy proposed in the differing note is not at all conducive to the solution of the critical problem of waste management being faced by our country," says the rejoinder. In fact, some responses in the majority rejoinder, to the differing report are bizarre. Take, for instance, the setting of standards. "We strongly suggest internationally accepted standard (for dioxins) as interim measure," says the differing report. And look at what the majority group has to say about an issue that has grave public health concerns. "The Committee feels that the problem of pops (persistent organic polluters) is important but in the present context is being blown out of proportion...there is no reason to stop any activity until standards are laid down as this will only delay something which is required by the country so urgently. This suggestion by the two members in their note can only prove to be an unnecessary and avoidable road-block in the long run," says the rejoinder. "It is very simple to propose an incineration plant but very difficult to run it. It has huge emission problems. Who will monitor the quality of emissions? spcbs are not even able to monitor the existing hazardous waste units. How can you expect them to monitor incinerators?" asks a cpcb official. Currently, Indian regulators don't monitor dioxins. "We have plans, but they are not time-bound," says the official. When compared with other garbage disposal options, incinerators are considered highly expensive. And this is without including the prohibitive costs of emissions control equipments that are not mandatory currently in India. "All over the industrialised world, almost half the investment of their cost goes in emission control systems," says Krishna. It is common knowledge that India's informal recycling system, run by hundreds of thousands of unrecognised and exploited ragpickers, is highly efficient. This is why the calorific value of garbage is so low. "Considering the characteristics of typical Indian waste (about 50-60 per cent compostables, 30-40 per cent inerts) composting is still the first choice, as it is well demonstrated and can be applied at household level to very large scale (say 1000 t/day). However, it is to be integrated with a marketing network for the compost, diversion of inerts at the collection stage itself, and provision for disposal of residuals by landfilling," says Kurian Joseph, assistant professor of environmental engineering at the Centre for Environmental Studies, Anna University, Chennai. The Union ministry of environment and forests brought out a white paper on pollution in Delhi.Based on a critical analysis of biological treatment, it recommends composting over incineration "The experiences of the incineration plant at Timarpur, Delhi, support the fact that thermal treatment of municipal solid waste is not feasible in situations where the waste has a low calorific value." The committee appointed in 1998 by the Supreme court says "Calorific value of Indian waste is 800-1,000 kilo calories, which is very low. It is not suitable for incineration." (People who understand garbage incinerators say waste should have a minimum calorific value of 2,000 kcal for making wte work.) It does not recommend incineration of garbage because of the high ash and dust contents of Indian wastes. It also says incineration is not environmentally friendly, has high capital costs (especially for emission control), and has high operation and maintenance costs. Nema says the wte concept is fundamentally unsuitable in a warm country like India and, therefore, economically unviable "If 100 units is the input in a direct combustion incinerator, only about 25 units will come out as energy." Of the remaining 75 per cent, about 34 per cent is lost as heat. "In colder climes like in Europe, this 34 per cent heat is trapped and channelled into home heating systems, providing additional revenue generation that is critical for the financial viability of the incineration system," he explains. A report by The Energy and Resources Institute of Delhi says the existing wte plants "have not proven themselves techno-economically". Comments Krishna "It is surprising that the report still advocates some form of government subsidy to make wte facilities more viable in India." "Recycling and re-use, in almost all cases, is likely to be more efficient than direct combustion... no technological interventions [should] become an obstacle in promoting segregation, recycling and other such more difficult but desirable processes," says the wte expert committee report. The differing members' report emphasises that wte projects should be taken up for research and development only. It also feels the dire need to improve stakeholder involvement in the collection and transport of garbage in line with the 74th amendment to the Constitution of India. In March 2003, the moud appointed an inter-ministerial task force on using city compost for plant nutrient management, in accordance with court orders. Its 2005 report has been accepted by the ministry and, in September 2006, the court also ordered its implementation with immediate effect. What did it recommend? Setting up 1,000 composting plants based on garbage in cities across the country. "The Planning Commission recommended some kind of subsidy to organic manure produced in compost plants, just as there is a subsidy for fertilisers," says Khanna, who was on the task force. "Every year about Rs 14,000-crore subsidy is granted for fertiliser sale. It would be highly desirable to allocate 5 per cent of that for the sale of compost... Since funds available with the ministry of agriculture for setting up of the compost plants are very meagre, adequate funds to the extent of Rs 700 crore should be provided by the ministry of finance to set up about 1,000 compost plants in different cities," says the report. It asks municipalities to segregate bio-degradables and supply them free to compost plants. Nema says that none of the technologies including compost and biomethanation would work in isolation "Waste deserves a decent burial. We cannot treat it as a money-making exercise. We can use any option for biological stabilisation or treatment, but ultimately we have to go in for scientific landfilling. Unlike any other mode of disposal, landfill is very forgiving. It can tolerate any kinds of fluctuations in both quality and quantity of waste," he concludes. "We need a dedicated institutional mechanism. Waste management is mostly under municipal health services, headed by medical doctors that may not be well versed with waste management, and have several other priorities," says Joseph. "Many private parties have started compost plants, and many more are willing to invest in cleaning cities and revitalising our depleted soils with organic manure," says Patel. One of the best articles that I have come across which explains the waste management situation in India. Very well written, covering all aspects in chronological order and with real life comments from the experts. Hi... I am also interested to work for this waste management. Pls let me know if it's suitable we can discuss & work for it. 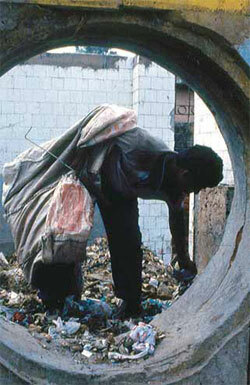 on waste disposal is a large problem in India . i have a project through this we can a business in world label. 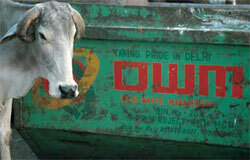 We are just started thinking to get into waste management but still we have to decide for yes or no for it. Can we get into the SWM as business opportunity ?If yes , then how and what we earn from it in next Five years? Note:- a) We want to invest 30Cr -50 Cr in it. b) Our Plant location will be Lucknow preferably . I have the permanent solution for garbage dumping ground issues with zero land fill zero pollution garbage procssing is completely with in 6o MINUTES Without segregation. US PATENT TECHNOLOGY TO CONVERT garbage to pellets with in 6o MINUTES. There is a solution for organic food waste, which is the mail problem for disposing. Dumping food waste in landfills generates METHANE gas, which main concern for any pollution control boards. We have a solution which 100% avoids landfills , which means no METHANE gas generation. It will also totally avoids carrying food waste to long distances which means saving of large amount of money to municipal corporations. Pl. provide your contact information to send you details. i am intrested muncipal Corporation waste manejmant plant please discuss me. I am interested for set up waste management plant at Rudarpur Uttarakhand. Pleas let me know cost, running cost for setting a small scale initially. My no. Is 9917712737.
i am finding this type of detail since 2 year. thank you for this, i am really interested to clean environment for this way i want to help nation and our refuter on the usage of waste management. i am interested to run this project in saurastra rural (Gujarat). please share full detail of project.